William Yeadon was a little-known clockmaker, who worked at Stourbridge in Worcestershire. Pretty well nothing was known about him other than that a clock or two by him had been recorded estimated to date from the 1760s or 1770s. Two of the three I have personally seen were high quality clocks of about this period, the third (pictured here) being earlier. I thought it would be interesting to investigate a little. The search into his time at Stourbridge was straightforward enough but his origins before that remain unknown. I soon established that he was working at Stourbridge by June of 1743, when what seems to be his eldest child was baptised, named Elizabeth. But before that - nothing. The Yeadon name does not appear in that region until William moved there from parts unknown, perhaps around 1742. 1. 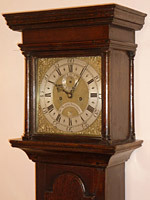 This is a simple oak-cased country farmhouse type of clock made by William Yeadon of Stourbridge in the 1740s, probably one of his earliest clocks. The very slender shape is typical of the period. There was a William Yeadon who was bound apprentice on the 7th June 1738 to William Pridham, watchmaker, of St. Botolph's Aldgate in London for four years at a premium of £15. 15s 0d. (£15.75p). It seemed to me very likely this was the same man. Pridham was not in the Clockmakers' Company, though there were many excellent clockmakers who had arisen through membership of quite different City Companies or even through none at all, and none the worse for that. An apprentice was usually bound at the age of fourteen, which might mean our William Yeadon was born in 1724 and would end his apprenticeship at the age of 21 in 1745. BUT ... being bound for four years was very unusual, as seven years was the normal term. Did that mean the boy was older than usual, such as 17, and would still end his term at the age of 21 in 1742? Did it perhaps also mean that he had already had three years of training? We have no way of knowing. We can deduce that William Yeadon ended his apprenticeship with William Pridham in June 1742, and we can guess that he was then 21 years old. Suddenly he appears at Stourbridge, where we know of no previous connection, aged 21 we assume, and with a wife named Sarah, having a baby daughter baptised on the 26th June 1743. He was not allowed to marry when still an apprentice, so, allowing the girl was not already pregnant at marriage, we can assume they married between June and September of 1742. I can trace no such marriage, and it could have taken place anywhere - or maybe not at all? 2. The hood of William Yeadon's clock shows how the slender look is achieved by pillars-attached-to-hood-door style. I did find a William Yeadon (son of Joseph Yeadon) who was baptised on August 7th 1720 at Guiseley in West Yorkshire. At this time the Yeadon surname was of very localised distribution, being largely around Guiseley and Bradford - the surname perhaps deriving from the township of Yeadon near Guiseley. This William Yeadon would fit the apprentice for age, but there were so many Yeadons living in Guiseley later than I could not rule out that this 1720 William remained nearby and the date of his birth was no more than a chance co-incidence. So William Yeadon the newly-qualified clockmaker from London arrived at Stourbridge shortly before June 1743. But there was already a long-established clockmaking family at Stourbridge (previously known as Old Swinford) who had been there since shortly before 1700 - the Stokes family, about whom I wrote in Clocks Magazine in June 2010. Would young William Yeadon have had the brass neck to move to open up business in a small Midlands town where a clockmaking family had cornered the market for forty years or more? It seems to me a bit of a risky move. Or did he perhaps move there to work as a journeyman for the Stokes family? We have no real way of knowing. 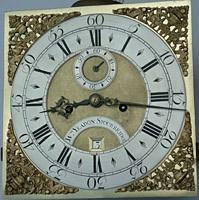 Yet the clock pictured here by William Yeadon can date no later than 1750. If he did move to Stourbridge to work for the Stokes family, then he can hardly have worked for them for long. 3. The eleven-inch dial of William Yeadon's clock newly cleaned, signed 'Wm. YEADON STOURBRIDGE'. William and Sarah obviously settled into their new location for they went on to have a total of ten children. Eight of them are known to have died in infancy, possibly nine. Eight were buried as infants, but a ninth child named Richard, baptised in 1750, was not heard of again and perhaps died young. The only known surviving child was a son, William, baptised on the 26th July 1747. William the clockmaker appears to have lived there till his death in 1768, aged about 48. He was therefore making clocks here for about twenty five years. His widow, Sarah, lived on till her death in 1770. 4. A right-hand view of the movement. Matching wheel collets and pinions show the wheelwork is original throughout. It is not known what trade was followed by William Yeadon (II), who went on to marry there in 1779 to Elizabeth Cook. He in turn lived on to the age of 84, dying in 1828. He too had a son, William (III), who was still living at the time of the 1841 census, when he was described as a labourer. Master clockmaker to labourer in three generations!